This past January, Lynsey Cole was on her way home from work when she came upon the scene of an automobile accident. Lynsey, who works for Virgin Atlantic as cabin crew, stopped her car to render assistance. Still wearing her uniform, she helped others to move the injured motorist away from his overturned car, which was on fire. She then administered first aid to the injured man until paramedics arrived on the scene. "I am extremely pleased to be able to recognise Lynsey’s actions with this special commendation, through her brave efforts along with other motorists, she helped in saving a life. Throughout the ordeal and without any emergency services being on the scene, Lynsey remained calm and professional, so much so that she played down her part in the rescue! “She is a credit not only to herself, but to her family and the company she works for. I know that the firefighters at the scene were impressed with her response and brought her actions to my attention for appropriate formal recognition. The Crew Manager in charge of the incident stated he would happy for Lynsey to join the Fire & Rescue Service should she ever consider changing careers - our gain would be Virgin’s loss!" "After seeing the car accident I realised quickly that it was serious and that because of my training, I could maybe be of some help. It didn’t occur to me that being on the wrong side of the motorway would be a problem so I decided to stop and walk across to the other side. I think because I was in my work uniform I was still in work mode so my reaction was to help as quickly as possible and use my first aid training. I was just pleased I could help and feel honoured to receive this commendation." Lynsey also was publicly praised by Sir Richard Branson, President of Virgin Atlantic. 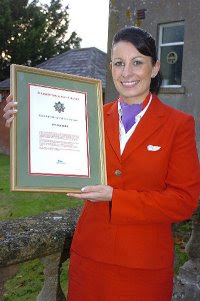 Congratulations to Lynsey Cole on her well-deserved commendation, and for being such a credit to the flight attendant profession. Last week, United Airlines announced plans to retire 100 aircraft, end its low-fare Ted service, and cut over 1,000 jobs. In conjunction with those plans, the airline announced that it will offer "a one-time opportunity for eligible flight attendants to voluntarily separate from the company." Known as the Early Out Program, the voluntary separations will be made available for up to 600 senior United flight attendants. Flight attendants who are at least 45 years old and have at least 15 years of flight attendant service with the company as of August 1, 2008 will be eligible to participate. Participants will be entitled to severance payments based on years of service and retiree travel benefits. Sounds potentially attractive on the surface, but is this a good deal for senior flight attendants or not? The answer is, "It depends." Mostly it depends on whether the flight attendant has another source of income to rely on, and access to affordable health insurance coverage. Flight attendants aged 45 or greater, and with at least 15 years service are eligible for the Early Out. Flight attendants aged 55 or greater, and with at least 15 years service are eligible for retirement, plus the Early Out. Early Out Severance Pay will consist of $500 for each year of service as a Flight Attendant up to 25 years ($12,500 cap). Total pay is distributed in 12 equal installments beginning January 2009. Example: 18 years of Flight Attendant service equals $9000. This would be paid out at $750 per month, before taxes, for 12 months. Travel Benefits - retiree travel pass benefits provided for all Early Out participants. Life Insurance will be provided only for those who enter retirement at the time of the Early Out. Medical Insurance will be provided for those Early Out participants who also retire, but not to those who are too young to do so. The latter will be able "to purchase COBRA for continued medical coverage for 18 months at the full cost of the insurance and administration." United Airlines flight attendants who meet the age and length of service criteria for the Early Out Program would have been employed by the airline prior to and during the carrier's recent bankruptcy period. That means that they had their company pension plans terminated in 2005. At that time, United Airlines defaulted on its pension obligations, and the Pension Benefit Guaranty Corporation (PBGC) took over pensions for workers at the airline, including the flight attendants. Federal regulations limit the amount of pension payments the PBGC can make -- an amount far less than the original pensions -- and by law, that amount is further reduced if the worker retires early, i.e., before age 65. As a result, many flight attendants at United have since felt that they had no practical choice but to continue working until their 65th birthdays. To do otherwise would put them in serious financial straits. In light of that situation, it seems that the current Early Out Program will be attractive mostly to those who already have a substantial second income, or whose spouses' or partners' income and health care benefits are sufficient to support them. When Singapore Airlines male cabin crew begin wearing their new designer uniforms later this month, it will not be a hat that makes the man -- it will be the tie. Designed by veteran French fashion designer Christophe Galibert, artistic Director of Balmain Uniformes, the new look features a smart new single-breasted navy blue suit, worn with a sky blue shirt and a striped tie. 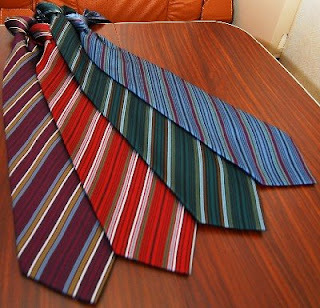 It is the tie that will distinguish one crew position from another. The designer, Mr. Galibert, said, "The entire Balmain team was thrilled to embark on the mission of designing the Singapore Airlines male cabin crew uniform and bringing to it our own international touch. "In designing this new look, our main aim was to retain the legendary elegance of the Singapore Airlines male cabin crew but at the same time make it more consistent with the iconic creation of Mr Pierre Balmain’s sarong kebaya. Our challenge was, therefore, to find a matching smartness and unique sophistication for the male crew uniform." The sarong kebaya uniform worn by female cabin crew at Singapore Airlines also is a Balmain design. The colors of the new male cabin crew uniform, including the ties, were chosen to coordinate with the colors of the women's sarong kebaya. Mr. Tan Pee Teck, Senior Vice President Cabin Crew at Singapore Airlines added, "The new uniform projects a smart and professional image and will instill a sense of pride in the crew. This is even more so since many of our crew members were themselves actively involved in the selection and fine-tuning of the design concept and colour scheme of the uniform." The current male cabin crew uniform, consisting of grey pants and jackets in several colors, was designed by Lanvin in 1991. 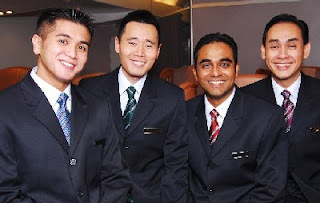 Male cabin crew at Singapore Airlines will begin wearing their new designer uniforms on June 30, 2008. According to Singapore Airlines, the carrier currently employs 7,375 cabin crew members, of which almost 40% are male. The Association of Flight Attendants (AFA) has filed formal charges with the National Mediation Board (NMB) against Delta Air Lines alleging that the carrier's management illegally interfered with a recent union representation election among Delta's flight attendants. The allegations "include substantial evidence that Delta flight attendants were denied a free and fair election due to management's aggressive tactics aimed at defeating union representation." In February of this year, a majority of Delta Air Lines flight attendants signed cards indicating that they wanted union representation. This was the first step in the unionization process. The second step was an official election to determine union representation, a process which ended on May 28. Under the rules of the NMB, which supervises such elections, 50%-plus-one of all those eligible to vote must do so in order for an election to be certified. In the recent election, only 40% of eligible Delta Air Lines flight attendants cast ballots, thus even though the vast majority of those votes favored the AFA, the election could not be certified. In a statement issued by the AFA, the organization's International President, Patricia Friend, said, "Delta flight attendants were denied the opportunity to freely participate in this election without being intimidated by management and heavy-handed efforts to keep them from gaining a voice. A majority of Delta flight attendants wanted the opportunity to have an election and they deserve an election that is free and fair. We now look for the NMB to stand up for that right and hold Delta executives accountable for their actions." If the NMB finds sufficient evidence that illegal interference occurred, it can set a new election. AFA-CWA is asking for a new election with a balloting procedure that will limit the effects of any further illegal conduct by Delta management. By rerunning the election using a 'Laker' Ballot, flight attendants will be permitted to vote "Yes" or "No" for AFA-CWA representation. In the previous election, flight attendants were discouraged from participating in the voting process as only the "Yes" votes were counted, thereby automatically counting those who did not vote as "No" votes. Meanwhile, Delta's plans for a merger with Northwest Airlines are moving forward. Northwest's flight attendants already are represented by the AFA, and they have expressed an intention to stay with the union after the merger is complete. Flight attendants at Aeroméxico have agreed to a new pay and benefits package that includes a 4.5% raise. This amount was a compromise: earlier the airline had offered 4.25%, while the flight attendants initially had asked for a 5% raise in salary. The new pay package, announced on June 1, 2008, "will cut benefits like parking and dry cleaning payments and subsidized uniforms," according to a Reuters article about the agreement. Privately owned Aeroméxico, the largest airline in Mexico, employs some 1,500 flight attendants. The flight attendants' union had threatened to strike if a new pay agreement had not been reached by June 1, 2008. Matt Keegan over at CabinManagers.com has posted his monthly hiring forecast for cabin crew positions. The June, 2008 report focuses on flight attendant job opportunities with charter carriers. One question that prospective candidates have in mind when working for a charter airline is this — are they stable enough to survive the ups and downs of the business? 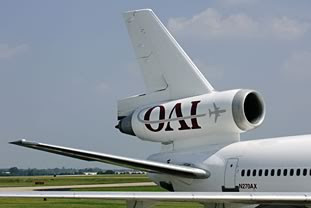 Though it is impossible to predict how any airline will perform long term, the advantage for a charter operator is that their increased costs (namely fuel) are passed on to the customers. Unlike scheduled airlines who must hold the line on costs or risk losing business, the pressure for charter operators is a bit different — they still want to offer the best service at a decent price, but they can only do this by recouping their rising costs from their customers. If you are interested in a career as cabin crew on a charter carrier, go and have a look at the new article about working for charter airlines on CabinManagers.com -- and good luck with your job search.